Facts about Pumpkinseed Sunfish. "Scientific name for pumpkinseed sunfish is Lepomis gibbosus". Pumpkinseed Sunfish is a freshwater fish of the sunfish family. Other names such as the Common sunfish, yellow sunfish, bream, punky, Round Sunfish, Bream, Sun Bass, Sunny and Speckled Perch. (Centrarchidae) of order Perciformes. The world Record was 1 Lb. 6 oz (.72 kg). for a pumpkinseed sunfish it was caught in New York in 1985. The pumpkinseeds sunfish looks a lot like bluegills fish, and you usually find them in the same habitat. A good way to tell the difference between them, because they look so alike, is by the opercle flap. It’s black in both groups of fish, but the Pumpkinseed Sunfish has a distinctive crimson-def(Of a rich deep red color inclining to purple) spot in a halfmoon shape on the back rear edge. The Pumpkinseed Sunfish has 7-8 dark vertical bands on their sides that are different and fainter than the ones found on the bluegill. Additionally, the Pumpkinseed Sunfish has several narrow corrugated stripes, repeating orange-brown or light blue. The Pumpkinseed Sunfish typically ranges in size from four to 10 inches (10.2 to 25.4 cm), and reaches a maximum size just over 15 inches (38 cm). Pumpkinseed Sunfish are a member of the sunfish family (Centrarchidae) of the (order Perciformes- means one of the largest natural groups of fishes of both marine and fresh water: true perches; basses; tuna). Lepomis, in Greek, means "scaled gill cover" and macrochirus means large hand, which may be a reference to its body shape. Pumpkinseed Sunfish have a small mouth and eats bugs and small fish. they will eat almost anything they can get in their mouth, including worms, small minnows, insects and crayfish. Pumpkinseed Sunfish can be caught on all kinds of live bait including small minnows, earthworms, crickets, meal worms and freshwater shrimp. Artificial bait good for Pumpkinseed Sunfish are small spinners, corn, rubber worms, jigs as well as all kinds of dry and wet flies. 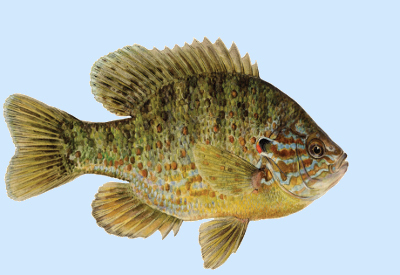 Pumpkinseed sunfish are nest spawners with the male digging a nest in water as little as 5 to 14 inches. Spawning begins in May or June and the male guards the nest until the eggs are hatch. The female will lay between 1,500 to 2,800 eggs. More than one females may lay eggs in one nest. Pumpkinseed sunfish are usually the first Lepomis sunfish species to spawn in the spring. Pumpkinseed Sunfish will spawn when the water they live in is over 65 degrees Fahrenheit (18 cel).